Triumph only track day Castle Combe Weds 4th April. 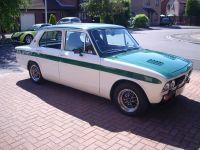 Post subject: Triumph only track day Castle Combe Weds 4th April. Well Dolomite pilots how many are going? The TR Register is putting this on for all Triumphs including Triumph powered kit cars. I will be there with Dave who's engine I built with a STR91 cam and all the stuff like balancing lightened flywheel etc. I am really looking forward to a fine day Triumphing. Here's hoping for some fine spring weather. The lunatic is out................heres Jonny! 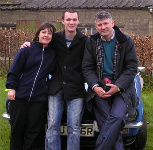 Post subject: Re: Triumph only track day Castle Combe 7th April. I'm popping down to spectate for a bit if that counts! Is it free to spectate ? Just checked again to be sure, this event is on the 4th of April (Wednesday) not the 7th as stated on the header! I'm going, but will be burning some midnight oil in the meantime as the head gasket has failed on the Carledo! It's only a 3 hour job to replace it and I can do this 8v head in my sleep, but the head skim in the middle makes it a 2 day job, with 72 miles of transporting the head to the machine shop and collecting it once it's done! I'll probably spend more time driving the head round the countryside than doing the job itself! Never mind, all part of the fun! Plus the MOT runs out on (you guessed it) April 4th! So that will need doing too! And YES! Spectators get in free! Still some spots available for anyone who wants a go! they are that desperate to sell that they'll accept ANYTHING old, not just Triumphs! £120 will get you around 90 mins of track time in 15 min sessions (around 8 laps a time) but can be more as they will be doing an "open pit lane" after lunch. Checkout the TR Register shop and click on "Events" for details! As it's a Wednesday, I'll pop up (I don't work on a Wednesday). Be good to catch up. Doubt they'd let an eleven year old Porsche on track though! Try emailing Kev? They are after a few more entrants. More the merrier etc etc. And I will be there, but in the spitfire. And bringing No2 daughter again. This time I am sorting some seat pads so she WILL be able to drive. Plus there are a few "Total novice" sessions which should be ideal for her first time driving a trackday. In fact I won't be going , I thought it was on the 14th. On the 4th I'll be on holiday in Belgium, so bit of a stretch! Oops wires crossed . Wednesday the 4th of April and I look forward to seeing you down there as I have not gone to Combe for some years it will be nice to return. Post subject: Re: Triumph only track day Castle Combe Weds 4th April. What a day, it was monsoon time of course and the rain just kept coming down in torrents. Sprints were well represented and performed well with just a couple of moments but sadly one Sprint was badly damaged after spinning off and colliding with the tyre barriers. Dave's white Sprint which was powered by an engine that I had built performed like the sports saloon that it is and he kindly allowed me to also drive it. He even let me take Diane (wife) for a few circuits to rekindle our desire for these great little cars, it was like the good old days. Guess what? For some reason I thought it was next week. Getting old is hard work. Still, I hope you enjoyed yourselves. A very odd day and a VERY challenging drive! Because of the constantly changing conditions, no two laps were the same, the track was getting wetter, then dryer then wetter again. At one point Quarry was bone dry and Paddock was flooded, which led to a small moment for me (not the only one either) But still great fun and more interesting (if that's the word) than just hammering round a dry track! The Carledo behaved faultlessly for the entire day as usual but the conditions have made me more aware of something i've been suspecting for some time, my front tyres are total CR*P and need replacing ASAP! Think I will go for another pair of Toyo T1Rs to match the back, i've been very pleased with these, nicely grippy, reasonable in the wet (nothing is REALLY good in the wet on this car) and surprisingly long lived for a soft compound tyre. Nice to finally meet Jon and Diane (and David) and my commiserations to Rob but i'm sure he'll get it fixed!